↑ 2.0 2.1 america. Dictionary.com. The American Heritage Dictionary of the English Language, Fourth Edition. Houghton Mifflin Company, 2004. http://dictionary.reference.com/browse/america (accessed: January 27, 2008). ↑ "America." The Oxford Companion to the English Language (ISBN 0-19-214183-X). McArthur, Tom, ed., 1992. New York: Oxford University Press, p. 33: "[16c: from the feminine of Americus, the Latinized first name of the explorer Amerigo Vespucci (1454-1512). A claim is also made for the name of Richard Ameryk, sheriff of Bristol and patron of John Cabot (Giovanni Caboto), the 16c Anglo-Italian explorer of North America. The name America first appeared on a map in 1507 by the German cartographer Martin Waldseemüller, referring to the area now called Brazil]. 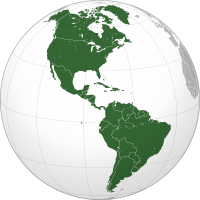 Since the 16c, a name of the western hemisphere, often in the plural Americas and more or less synonymous with the New World. Since the 18c, a name of the United States of America. The second sense is now primary in English: ... However, the term is open to uncertainties: ..."